Sometimes borders are a good thing and that includes in the garden. 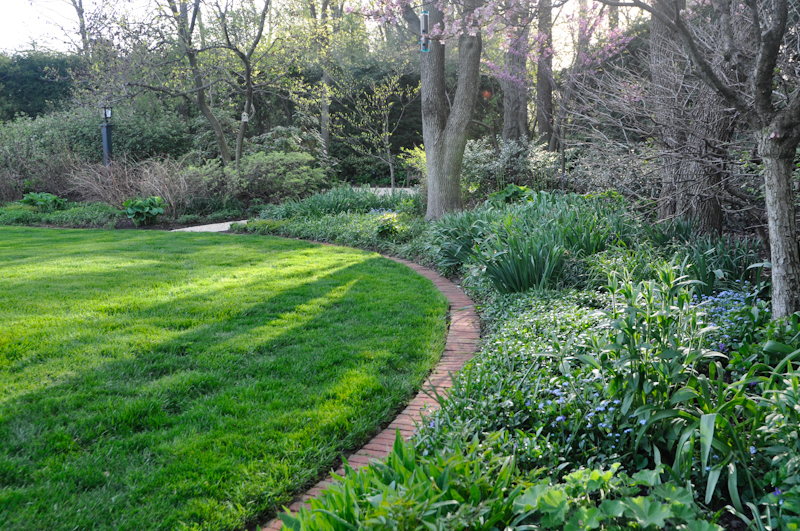 Edges help provide a transition between elements and can help contain gravel, mulch and turf from spreading. Besides its use for providing a barrier, edging provides an additional design element and should be considered detail. Metal edging along a gravel pathway. Bricks on edge between turf lawn and a perennial garden. Where and How to Edge: Edging is used in areas of loose stone to prevent from spreading into turf or beds, such as walkways, driveways and patio spaces. It can also be used to provide an edge along turf to prevent the spreading of grass into plant beds. Common materials used include brick, cut stone, slab stone and metal. 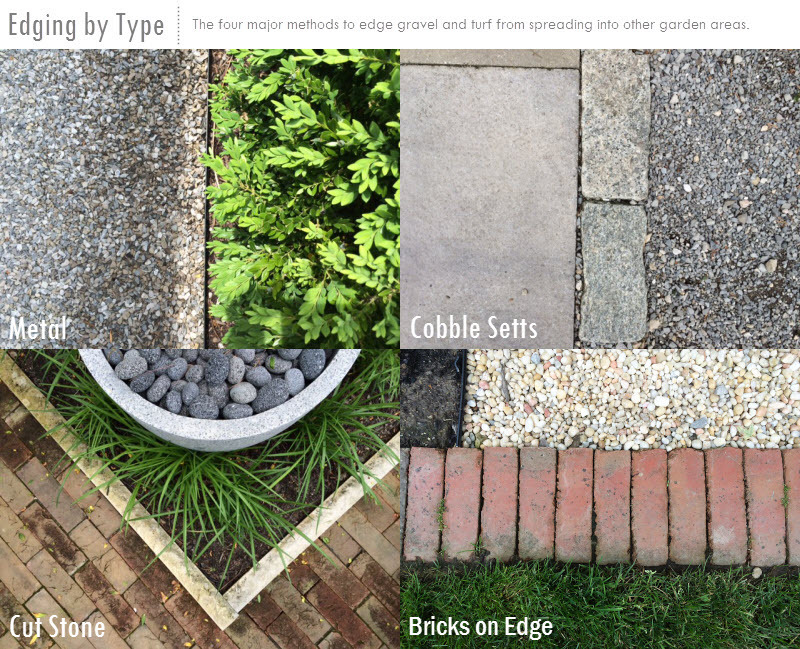 Below is a visual ID of four major edging types in use. Metal edging used to separate gravel bed and turf. Edging Problems: In areas where there is freezing and thawing, some edging material will heave out of the ground and will need to be periodically re-set. 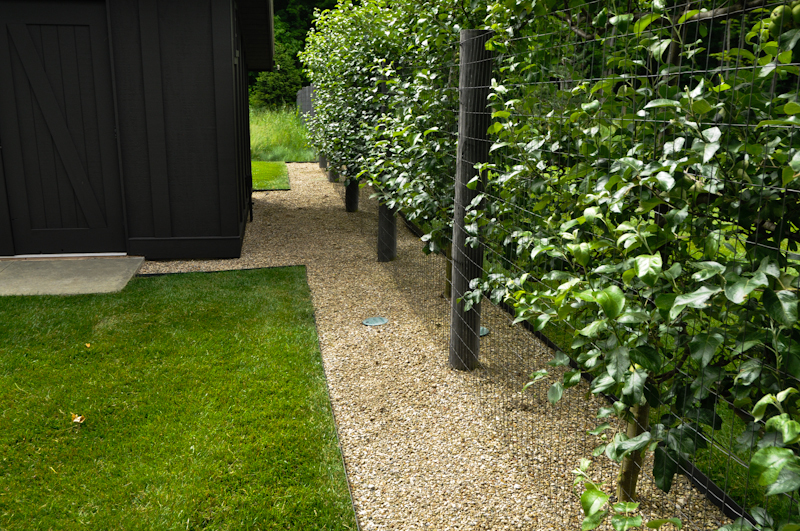 Edging is not a 100% foolproof barrier, gravel and grass will cross the line and will require maintenance. Also if the wrong gravel type is used or layered too thick, the barrier will not provide the intended function. 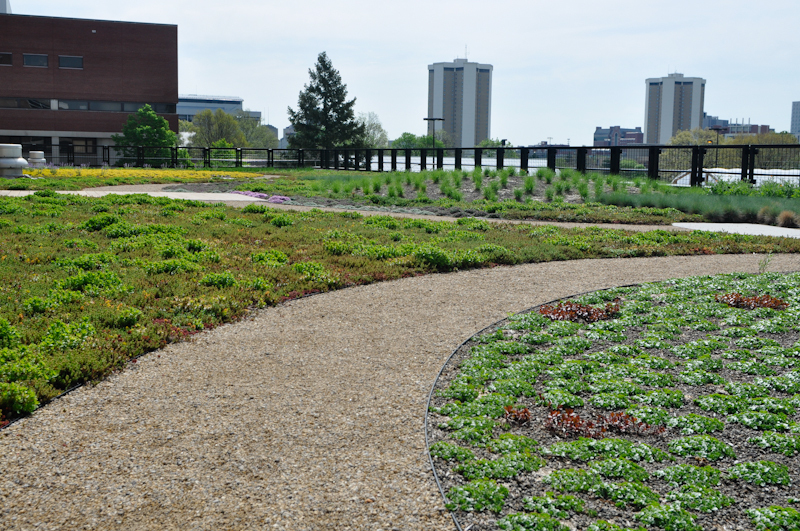 Metal edging along gravel path on a green roof. 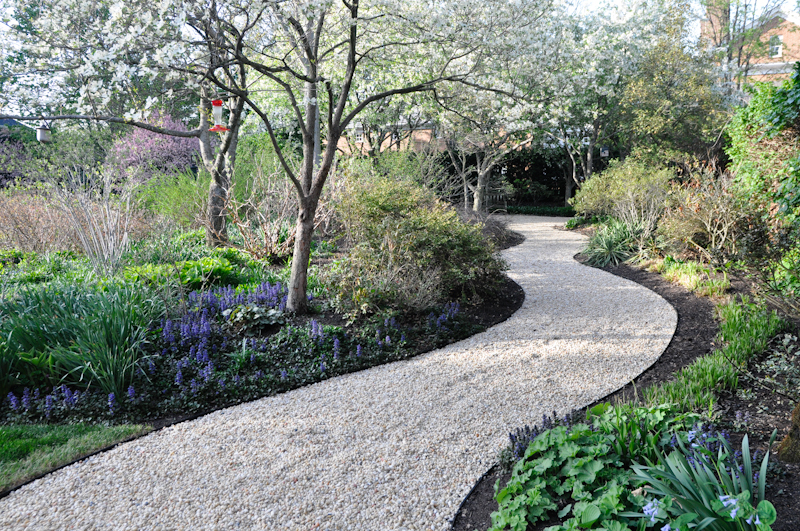 Metal edging along a gravel path into a perennial garden. 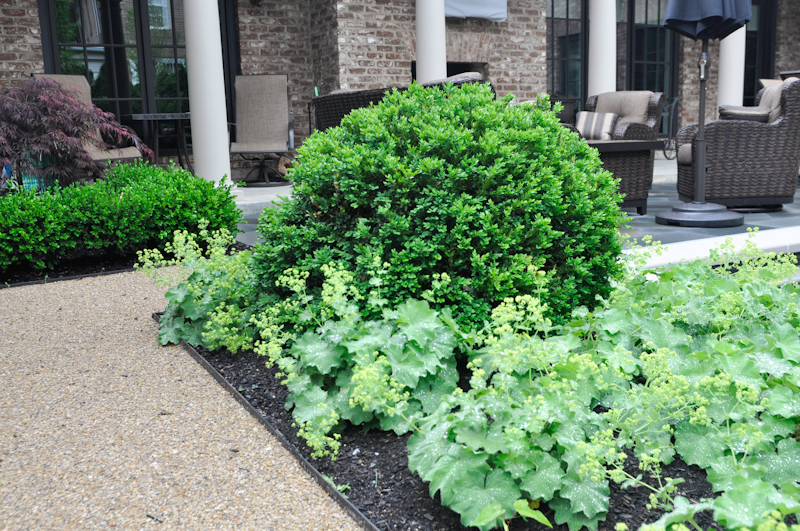 When Not to Using Edging: I don’t typically use edging around flower/perennial beds. I prefer to use a technique that includes a deep trench surrounding the bed. I use a sharp flat spade cut to make minor adjustments in the shape and insuring separation of the turf and bed. Also please stay away from those plastic edging. If you use the method above you will have better result of keep beds shaped and materials contained. I cannot think of too many cases where plastic is ever the best solution in the garden. This entry was posted in Advice, Central Ohio, cobblestone, edging, Formal Garden, G A R D E N S, gardening, Gardens, Inspiration, Landscape, Landscape Design, McCullough, My Work, New Albany, Ohio and tagged brick, bricks on edge, central ohio, cobble, cobble setts, Columbus, cut stone, edging, garden design, garden tools, landscape design, McCullough, metal edging, New Albany, Ohio, pea gravel, perennial design by Nick. Bookmark the permalink. Curious to know if you have an example (Pintrest maybe?) that shows the trench method you mentioned?